In today’s connected world we all have devices that allow us to communicate with colleagues, friends and family. The smartphone has become the “go-to” device for many people worldwide. According to a survey conducted by Pew Research in 20181, the number of Americans that own a smart phone has increased to 77%, up considerably from the 35% ownership reported in 2011. As the senior population continues to grow, with a total of approximately 46 million older Americans over 65, the adoption of smartphone by the senior population also continues to increase. In 2018, 46% of those over 65 reported ownership of a smartphone, a substantial increase over the reported ownership of 18% in 20112. For many of us, our smartphones allow us to take phone calls, and listen to music or podcasts using our wireless headsets or earbuds. Prior to smartphones, use of the telephone for hearing impaired individuals could be a challenge. If they were wearing hearing aids, they might have to find a location for the receiver near the microphone of the hearing aid that provided the necessary loudness for the telephone signal. Others relied on the t-coil, which at one time was a somewhat standard technology on many hearing aids. For individuals not using one of these methods, telephone communication often involved removing their hearing aids, and for some, unfortunately, simply not enjoying the use of the telephone. For individuals with hearing loss, the first step in streaming to their hearing aid involved the use of an intermediary device to re-transmit the signal from the phone to the hearing aids. However, the connectivity that has been recently provided by smartphones has become much easier due to Made For iPhone (MFi) streaming. The capability to stream directly from an iPhone using the 2.4-GHz band was introduced in hearing instruments in in 2014.3 The first devices with this technology were traditional behind-the-ear (BTE) or receiver-in-the-canal (RIC) form factors, with custom in-the-ear (ITE) instruments being introduced some time later. This delayed introduction of the custom instruments was due to three technical challenges: the limited space inside the custom shell, the smaller battery capacity of the custom devices limiting the streaming time, and establishing reliable connections from the smartphone to the hearing aid. These challenges resulted in many of the early users of custom devices reporting that the reliability and robustness of the streamed signal was not consistent, and the signal was of poor quality. While much of the focus in hearing aid signal processing is on the improvement of speech understanding, the sound quality of hearing instruments cannot be ignored. We have reported on a comparative study of overall sound quality (non-streaming) for six manufacturers using the MUSHRA methodology (MUltiple Stimuli with Hidden References and Anchor)4. In the MUSHRA approach, the test signals are recorded and made available for playback. In this way multiple devices or test signals can be rapidly compared. The results of this study indicated that the quality ratings of the Signia instruments were the highest, when compared to other instruments, and were significantly higher than the average of the five competitive models for several conditions including speech in quiet, speech in noise, and music. While you could assume a hearing aid with excellent sound quality for acoustic signals picked up by the microphone would also have excellent sound quality for a streaming signal, this might not be true. To examine the quality of streamed signals, a similar baseline study was designed to evaluate six signals (five types of music and a streamed telephone call).5 The participants were eight experienced listeners that had experience with audio signals and making judgements about audio signals. The results for the telephone conversation via streaming showed the mean ratings for intelligibility, sound quality and naturalness were higher for the Signia product than the industry average for all other competitive products. Secondly, the mean rating for all music types (classical, Instrumental, jazz, piano, pop) were substantially above the industry average ratings. The conclusion reached in this study indicated that the high ratings for Signia conventional signal processing are also were observed for streamed signals. Due to the previously mentioned issues with the consistency of streamed signals for custom ITE devices, a development project was implemented to establish the necessary signal processing and algorithms to deliver high-quality streaming signals for a custom device. Although the market for custom devices has decreased to approximately 16% in the US, these users are still seeking the same benefits as their BTE and RIC counterparts; a quality and reliable streaming experience. This was the impetus for the development of the Signia Nx ITC 312. This instrument is based on the current Nx platform in a standard in-the-canal (ITC) form factor with Bluetooth streaming capabilities. Is the Signia Nx ITC audio streaming sound quality highly acceptable? Is Signia Nx ITC audio streaming quality perceivably better than the best competitive product? Is Signia Nx ITC audio streaming robustness substantially better than the best competitive product? Is Signia Nx ITC all in all preferred over the competitive devices? To evaluate these research questions, 14 normal hearing subjects were recruited to participate in the study. They all had extensive experience with audio quality, and making judgements of audio quality. The participants were fitted bilaterally with the Signia Insio Nx 312 ITC RF MI custom instruments and a subset of the subjects were fitted with the only other comparable custom fit competitive streaming ITC instrument on the market. Both the Signia and the competitive instruments had direct streaming capabilities. The hearing instruments were fitted to a flat 40 dB HL hearing loss (from 250 Hz to 6000 Hz) using each manufacturers’ proprietary fitting method. The participants completed a series of rating scales related to the research questions. For the audio streaming quality evaluation, the participants were instructed to insert the pair of test devices into their ear and listen to both speech and music signals that were being streamed to the test devices in different realistic situations. Figure 1. Shown is the mean sound quality judgments (5-point scale) from trained listeners for the Signia ITC streamed signal. Error bars represent 95th percentile confidence intervals. Judgments made prior to listening to competitive product. Following the initial ratings with the Signia product, comparative testing was conducted using a subset of the participants. The results for both the Signia and the competitive product are shown in Figure 2. Observe that only 33% of the participants rated the competitive product equal or better than “Good” as compared to 83% for the Signia product. Figure 2. 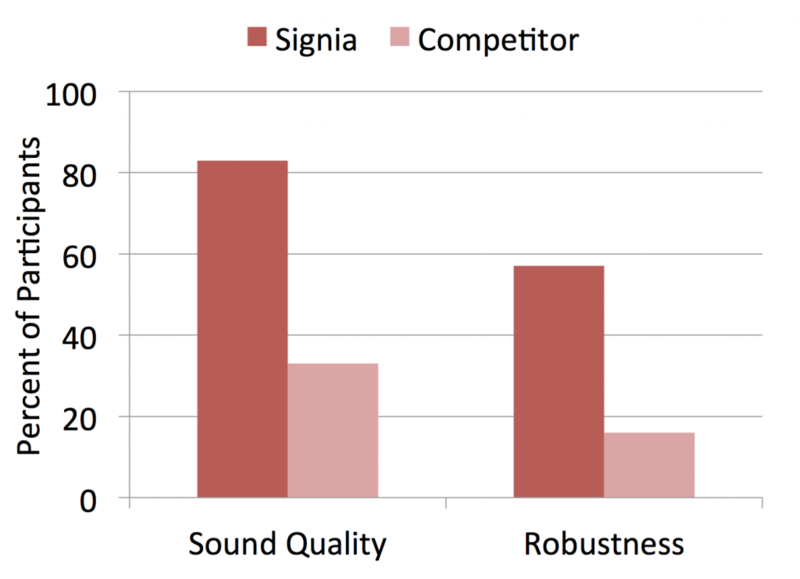 Shown is the percent of participants who rated streaming sound quality and robustness as either “Good” or “Excellent” (5-point scale) for Signia and the competitive product. 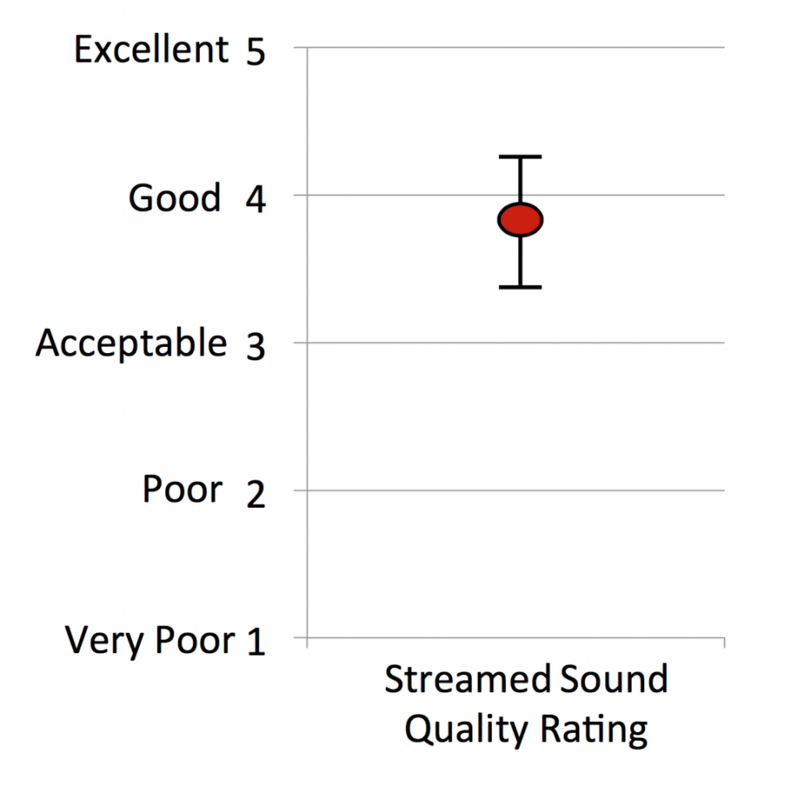 Following the quality ratings, the participants were asked to complete a rating for the robustness of the streaming using the five-point scale as shown in Figure 1, for both the Signia and the competitive product. Robustness can be defined as the ability of a system to cope with errors during execution and cope with erroneous input.6. An example related to streaming would be no breaks in the streaming signal, or drop-offs of the streamed signal. For this evaluation the participants judged the consistency and reliability (robustness) of the streamed signal to the hearing instruments. The results for both products are shown in Figure 2. As indicated, 57% of the participants rated the Signia instruments as Good or Excellent, while only 16% rated the competitive instrument as Good or Excellent. If the “Acceptable” rating was included, the Signia devices increased to 100%, while for the competitive devices, this only resulted in an increase to 33%. A third rating—a direct A/B comparative evaluation—was undertaken to assess the participants’ overall preference between the two devices on three dimensions: streaming quality; streaming robustness and overall preference. The preference scale ranged from “Equal” to “Very Strongly Prefer” on a 9-point scale, for preference in the direction of either device. After directly comparing the two pairs of hearing aids, the participants were asked to place an X on the scale for each preference rating. The results of the preference ratings are shown in Figure 3. 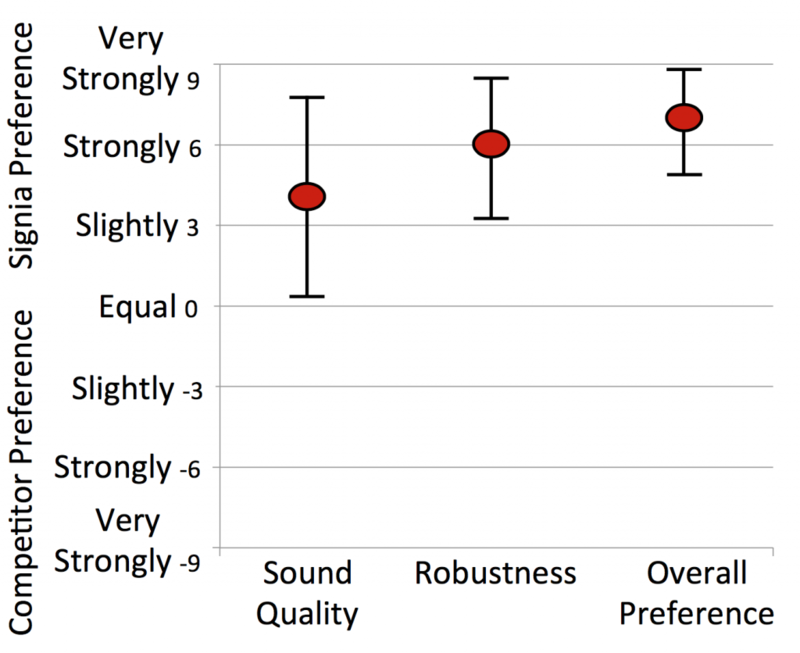 The mean ratings for audio streaming quality were 4.5 (between “Slightly” and Strongly”) in favor of Signia, mean audio streaming robustness was 6.0 (“Strongly”) favoring Signia, and overall streaming quality was 7.0 (between Strongly and Very Strongly) favoring Signia. As shown in Figure 3, the 95th confidence intervals clearly show the overall preference for Signia. In fact, individual ratings from all participants revealed that for all three rating categories, there were only two rating of “Equal,” and no ratings favoring the competitive instrument. Figure 3. Mean preference ratings (9-point scale) for Signia vs. competitive product based on head-to-head comparisons. Error bars represent 95th percentile confidence intervals. The development of hearing instruments must focus on several key components including the wearing comfort, quality of the speech signal provided and, most recently, the quality of the streaming signal. It is also important to offer the form factor that is best for a given patient. As more connected devices provide audio signals (smartphone, TV, personal assistants, etc. ), the quality of the streamed signal will be very important to those persons wearing hearing instruments. The industry has made great strides in the sound quality of the audio signal provided in hearing aids via directional microphone technology and digital noise reduction. These have led to improved speech understanding in both quiet and noisy listening environments. The results of this evaluation have shown that the streaming audio quality of the Signia Nx ITC instruments have achieved “best-in-class” audio streaming as compared to the only competitive custom streaming device. Hallenbeck, S. Groth, J. Staying competitive in connectivity: 5 things you need to know. Hearing Review 2014;21(5):24–25. Powers, T and Beilin, J. True advances in hearing aid technology: Where are they and where is the proof. Hearing Review 2013;(1):32–39. Froehlich, M. Junius, D. Branda, E. A comparison of signal quality of direct streaming hearing aids. Can Aud 2017(V4) Issue 4. Wikipedia contributors. (2017, November 2). Robustness (computer science). In Wikipedia, The Free Encyclopedia. Available at: https://en.wikipedia.org/w/index.php?title=Robustness_(computer_science)&oldid=808353306. Thomas A. Powers, PhD, is the Managing Member of Powers Consulting, LLC,. Dr. Powers serves an expert audiology consultant for the Better Hearing Institute, and as a Consultant for Sivantos, Inc. Dr. Powers received his B.S. from the State University of New York at Geneseo, and his MA and PhD in Audiology from Ohio University. He began his career as a partner in an Audiology private practice and has over 35 years of experience in the hearing health care industry. Prior to his current role, he was Vice-President, Government Services and Professional Relations for Sivantos, Inc.
Jürgen Distler is Global Product Manager for custom products at Sivantos GmbH in Erlangen, Germany. He is responsible for the product definition of all kind of In the Ear products. He joined Sivantos (then Siemens Audiology Group) in 1999, holding various positions in Sales, R&D and Product Management since then. He received his Dipl. Ing (FH) in precision engineering from the University of applied sciences Nuremberg.